Is your marriage and future happiness teetering on a cliff edge? Here at Save My Marriage Today we help people to arm themselves with tips and strategies to help prevent divorce. This information can help to rebuild an intimate and supportive marriage. Rather than telling you how great our advice is, we would rather show you so you can make an informed decision. WARNING: 'The 6 Most Common Reasons For Divorce' is not the same product or subsitute of the Save My Marriage Today! course. If you are reading this without having subscribed to my newsletter series, you're only getting a fraction of the marriage-saving advice that you could be getting for free. If your marriage is at a more critical stage, you're going to need much more than this. That's why I created my Save My Marriage Today! course. It contains real tools and exercises you can do to help resolve marital problems - including those in real crisis or on the verge of divorce or separation. Discover helpful advice on how to make a marriage work and assistance with lowering arguments. Help rediscover your love and the feelings for each other. Don't you think your partner and your marriage deserve it? I hope that you enjoy these insights, if you would like more information definitely check out our Save My Marriage Today! course. by Amy Waterman, author of Save My Marriage Today! Copyright © 2005 Unica Design Ltd. and 000Relationships Ltd.
All rights reserved. No part of this book may be reproduced or transmitted in any form or by any means, electrical or mechanical, including photocopying and recording, or by any information storage or retrieval system without permission in writing from the author. This information is not designed to replace the advice of a registered relationship counselor. While SaveMyMarriageToday endeavors to provide helpful and workable solutions for couples with relationship difficulties, face-to-face consultations with a registered professional are still recommended. The information contained in this book is provided 'as is,' without warranty of any kind. The entire risk as to the results and the performance of the information is assumed by the user, and in no event shall SaveMyMarriageToday be liable for any consequential, incidental or direct damages suffered in the course of using the information in this book. The information and recommendations in this publication are intended as an informative guide only and do not guarantee the successful resolution of your marriage problem. How to recognize when your relationship is in danger. Hint: it's not when you're arguing all the time! What to do if the love is gone. You'll be astounded at this advice! 25 Relationship Killers. Keep these from poisoning your relationship! The double 'D's. How disillusionment and disappointment can eat away at your marriage. In this section of the course, we're going to discuss the real marriage killer. It's not conflict. It's not arguing. It's not sniping at each other all the time. It's the loss of love and intimacy. When you stop respecting your partner, you've set your marriage on the path to divorce. In this lesson, I'll show you exactly how it happens and how to prevent it. Let's take a moment to review what you learned in the last lesson. In Part I, we discussed how factors beyond your control can affect how likely you are to divorce, including whether or not you're from a broken family, your age at marriage, and whether or not you lived together before marriage. While these factors can make you statistically more or less likely to divorce, they're not determining factors. You personally have an enormous power to influence and control the course of your marriage. By acting the way you want to feel rather than reacting to your situation, you can stop the deterioration of your marriage in its tracks and set it on the path to healing and recovery. Sound impossible? It's not, but it is extremely difficult. Most people are highly resistant to change. By now, you've built up patterns of negative behavior in your marriage (even if you thought you were doing nothing wrong), and it will take effort, determination, and absolute commitment to change yourself. Changing yourself is the only way to save your marriage. I'm not going to tell you how to manipulate or change your partner. I'm won't validate your need to blame your partner. That's because playing the victim will not save your marriage. You cannot abdicate responsibility for marital conflict-even if you don't think you're the one “with the problem.” That's because every marital conflict has two components: the behavior and the response. For something to cause problems in a marriage, the response to a behavior is more important than the behavior. In other words, even if you think your partner's actions are causing problems in your marriage, your response to those actions are actually more important to your marriage than the actions themselves. This can be difficult to grasp fully, so let's look at an example. Mary's husband always promises to bring home the groceries that she needs but always forgets to do so. For Mary, this is inexcusable. His broken promises erode the trust in their marriage. She is sorely tempted to react emotionally to the situation and lash out at her husband every time he comes home empty-handed. But she knows that this response will drive her husband away further. Instead, she decides to respond proactively and develops a plan of action. The next time her husband forgets to bring home the groceries she needs for dinner, she doesn't blame or criticize him. Instead, she sets her husband to watching the children, gets in the car, and drives to the store to get the groceries she needs. She enjoys her small outing without feeling bitter. Although they have a late dinner that night, her husband sees that she's not angry with him. After a few more times like this, Mary realizes that the most important goal in the situation is to have what she needs to make her family dinner-no matter who gets the groceries. Her husband realizes that not having the groceries does indeed inconvenience Mary. As a result, her husband eventually asks her what they could do so that one of them doesn't have to get the groceries during the week. He confesses that he doesn't get the groceries because he is tired after work and hates having to make a detour to the store. As a result, Mary and her husband decide to plan better and spend a bit more time on their weekend shopping trip so that they don't run out of food mid-week. Mary's response transformed a high-tension situation into a manageable one-even though her husband's behavior didn't change. Was Mary's response an easy one to make? No. She wanted to react emotionally, and it took an enormous amount of self-control not to give into the temptation to blame him or feel resentful. It took time and creativity to decide the best plan of action in the situation. Mary knew that it would have been so much easier just to give in to her anger and expect her husband to change, but she made the effort because she valued her marriage. As I said before and will say many more times again, saving your marriage takes effort, dedication, and absolute commitment. It's not easy, but an easy solution is like a band-aid. It will hide the wounds but won't keep your marriage from getting injured again and again. To measure your commitment to saving your marriage, consider this story. I often ask people how much effort they put into losing weight. One woman told me that she'd bought dozens of books, tried a hundred and one diets, and even pumped money into a professional weight-loss program. Yet this very same woman had an unfulfilling marriage with a husband who could do no right. “If you put that much money into weight loss,” I told her, “why do you put less effort into saving your marriage?” She was stunned. She'd expected her husband to change to save their marriage; she didn't think that she had to do anything. When you don't put effort into your relationship, love dies. Remember that a marriage either grows or weakens. Think of your marriage like a plant: if you fertilize it, water it, and notice when it is unhealthy, it will thrive. If you leave it to grow on its own, without any attention, it will wither. One of the most common marital complaints is that, “We're not in love anymore.” There are numerous people who file for divorce with the explanation, “I don't love my spouse anymore.” Where does love go and how can you get it back? Let me address the second question first. If you're the partner who's lost those loving feelings, there's a simple and effective answer to your question. Get it back by loving your partner. I first came across this method ten years ago. Stephen R. Covey, author of The 7 Habits of Highly Effective People, tells us that love isn't a feeling; it's an action. If you don't feel warm and affectionate towards your partner, ask yourself a simple question: are you acting warmly and affectionately towards your partner? If not, there's your solution. You cannot maintain feelings of love and affection unless you consistently act in a loving way towards your partner. This means that you listen to your partner. You compliment and verbally appreciate your partner. You think of a million and one ways to show your partner how much you respect, admire, trust, and believe in him or her. Maybe you give your partner a card on obscure holidays; maybe you surprise your partner by washing his or her car, or by initiating a back rub on a quiet weekday night. Read more about the concept of the Love Bank in my complete Save My Marriage Today! book. You may not be able to change your feelings by pure force of will, but you can change your behavior. Luckily, changing your behavior is often all it takes to change your feelings. If you don't love your partner anymore, love your partner even more. It's not a contradiction. Act out the love that you want to feel. If your partner is the one who doesn't love you anymore, don't go looking for blame. You cannot make your partner love you again by arguing, tears, manipulation, or threats. The only way you can recapture your partner's love for you is by being a more lovable person yourself. Most of us think that we're easy people to love. Love is an emotion: it can be turned on or off, right? Wrong. Love is an action, and unless it is acted out it will die. As a result, you may be resisting being loved without even knowing it. If you are uncomfortable giving and receiving loving acts, you may be a hard person to love. If you find it more comfortable to criticize than to compliment, you may be a hard person to love. If you shrink away from hugs and avoid kissing in public, you may be a hard person to love. If you show your affection towards your partner by teasing or making fun of him or her, you may be a hard person to love. If you always have to be right and don't listen to your partner, you may be a hard person to love. Lovable people love others. They are positive people. They enjoy physical intimacy and often initiate it. They trust and believe in their partner. They're proud of their partner, and they make sure their partner knows this. Because they are open and uncritical, their partners know that they can come to them with anything. Does this sound like you? Do you want it to sound like you? You may be thinking, “Those types of people are easily taken for the fool.” It's true. Lovable people can be taken advantage of. But the one place where no walls should exist is in a marriage. Your partner is not like other people. For intimacy to grow, both of you must be comfortable loving one another-both giving love and receiving it. The following relationship killers nip love in the bud. They'll make it impossible for your partner to love you and, as a result, will cause your partner's loving feelings to die. If any of them apply to you, it's up to you to change yourself. You cannot get your partner's love back until you make it easy for him or her to love you. You're disappointed in your partner. Your partner can sense when you are disappointed in him or her, even if you try to hide it. Respecting your partner is a must. You cannot have a healthy marriage if you are disappointed in your partner, period. You're disillusioned with your marriage. Disillusionment is another marriage killer. You may feel as if your marriage hasn't lived up to your expectations. If so, take responsibility for your feelings. Don't blame your partner or your marriage. If your marriage isn't what you want it to be, change it. If you're disillusioned, examine your expectations. Maybe they weren't realistic in the first place. You are responsible for your own happiness, and blaming your partner for not giving you the marriage you want is a cop-out. You don't respect your partner. In some ways, respect for your partner is even more important than love for your partner. Have you ever noticed how you find it easy to like people who look up to you? When you respect and admire your partner, your partner will feel more loving feelings towards you. If your partner feels as if he or she has to live up to your expectations, constantly disappoints you, or can never get it right, you've failed to show your partner the respect that he or she deserves. You don't like or respect yourself. You don't do what you say you are going to. You let pride get in the way. You always have to be right. You don't listen to your partner. You do things because they annoy your partner. You have temper tantrums and/or are unable to control your emotions. You are hurtful and put down your partner. You criticize your partner in front of others. You take pride in being difficult to live with. You're unwilling to meet your spouse's requests or compromise. You want your spouse to change who he or she is. You let others get between you and your spouse. You want to stay exactly how you are and resist growth. You can't handle stress and take it out on your spouse. You take everything your partner does or says personally. You always see the negative side of things. You refuse to admit there is a problem or seek professional help. You engage in alcohol or substance abuse. You are physically or verbally abusive to your spouse. If you would like to continue reading the 'The 6 Most Common Reasons for Divorce... And How to Stop Them Happening to You!' Introductory Course, please sign up to the free Introductory course below. 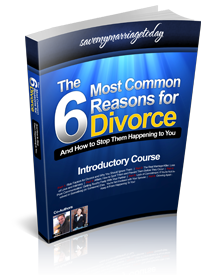 If you would like to continue reading ‘The 6 Most Common Reasons for Divorce.... And How to Stop Them Happening to You! !’ Introductory Course, enter in your name and email address in the box below. To ensure that there is no hidden agendas, a list of what you get has been provided. What You Get If You Sign Up! any third parties, Your privacy is important to us. Disclaimer: This information is not designed to replace the advice of a registered relationship counselor. While SaveMyMarriageToday endeavors to provide helpful and workable advice for dating and relationships, face-to-face consultations with a registered professional are still recommended. Information contained on this website is provided 'as is,' without warranty of any kind. The entire risk as to the results and the performance of the information is assumed by the user, and in no event shall SaveMyMarriageToday be liable for any consequential, incidental or direct damages suffered in the course of using the information on this website. The information and recommendations are intended as an informative guide only and do not guarantee any kind of success or permanent fix. Results may vary. © 2019 SaveMyMarriageToday.com All Rights Reserved. "SaveMyMarriageToday" are trademarks used by Unica Publications. By entering, you agree to our terms and conditions. By entering your email address you are also requesting and agreeing to subscribe to our free email newsletter. You must be 18 or older to enter.To contact support use the Contact Us link above.